Close to the top of the channel, close to fully overbought territory. The upside is limited in my opinion, and slow if it continues. I think it won't be in super rally mode given current indicators' values. 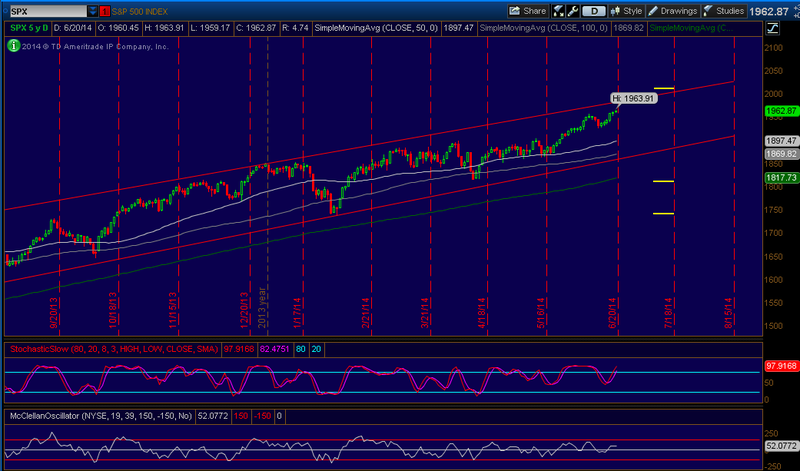 SPX 1735/1740/2010/2015 Iron Condor Still doing pretty good here, now with 4 weeks to go. I'm not concerned about this Iron Condor after the adjustment made on the Call side. SPY 191/197 Double Put Calendar Spread The VIX has kept going down and that has hurt this double calendar. The profitability range has shrunk and the max profit potential in the picture has decreased considerably. Here's a case of a trade that gurus out there would applaud as it is a "perfect fit for a low vol environment" and yet it is not doing well. Remember the motto: Nobody knows anything. Volatility can get as low as it wants to. That would hurt this position even further. There's still game in here. No time to exit. I will exit when/if SPY hits 200. SPX 1805/1810 Put spread. Pretty comfortable so far. No concerns. RUT 1050/1060/1260/1270 Iron Condor. The trade entered yesterday. Nothing to talk about here. With June expiration in the past the focus now shifts to July. July has been a pretty tough month so far, with an adjustment already in the records. Let's see if I can pull of a positive month. I am not really concerned with the July positions right now. If SPX hits 2000 then I will consider the July Iron Condor to be in danger and I will also close the SPY Double Put Calendar spread. I think SPX 2000 is unlikely this week, so time to do nothing. I could also consider a new Bear Call spread, using July options in RUT, that's if we go up a little bit more this week. Then, I would close the 2010/2015 SPX Call spread as soon as the market pulls back a little and I can exit for a scratch there. We'll see. As for August, I'm not really thinking of adding new positions at this point with all what's going on with July options. June ended successfully for me to as I had the RUT 98/96 and SPY 170/168 positions. They never gave me any trouble. 17% return annually is spectacular for most investors. I think once VIX goes up in the future, we can expect higher returns. We are overbought now. But the market can continue going up since there is nothing to stop it except some unexpected bit of news. I see RUT going above 1200 and SPX 2000 this summer. 2000 appears to be a magnet at this point. My plan is to roll the July SPX 2000/2005 credit call spread into August and iron condor it with a credit put spread to take in some more credit. I made a mistake by selling the July SPX 2000/2005 too early. I should have waited until last Friday to do it per my rules. I violated my rule because I wanted to be hedged going into the ECB meeting and Jobs reports. I have been trying to close the SPX 2000/2005 trade for scratch ever since then but have not been able to do it. Assuming the market takes a break next week or go down, I might be able to roll this into August for a slight debit. I forgot that I also have the July IWM 123/125 credit call spread. I like your comment that SPX 2000 at this point just looks like a magnet. We'll have to trade accordingly. As for your 2000/2005 Credit Call spread, man,....every time we violate our own rules the market seems to find a way to punish us. It happens to me as well,.....I do something funky and there goes my position going south. Good positions overall. Thanks for your comments.